As Borat on "Da Ali G. Show," rather than actually sing the Kazakh national anthem at a Savannah Sand Gnats game, he kept on repeating a famous Israeli folk song: (kum bachur atzel ve'tze la'avoda - "get up lazy guy and go to work." Never have I heard Sasha Baron Cohen use as much Hebrew as he did on the Howard Stern Show today. His Hebrew is actually pretty good! He must have attended a Jewish day school. 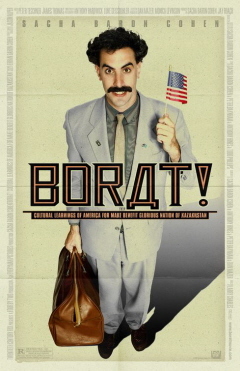 Here's the link to the JTA article about Borat's use of Hebrew.